Two powerful tools you can use when creating a collaborative site are Gravity Forms (affiliate link) and MailChimp. Gravity Forms is a supercharged form-building plugin that allows you to customize forms like a rock star…a rock star who has an internship at a form customization company, or something. MailChimp lets you send email campaigns in bulk and provides you with a robust mix of statistics to see how effectively you’re communicating with the recipients. 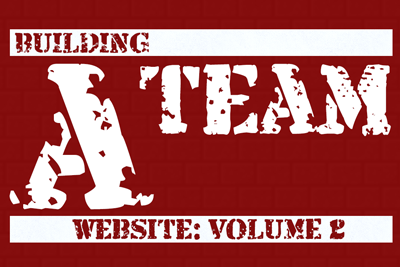 Let’s look at how these two could work together if you were building a collaborative site and wanted to find out more about the contributors to your project. 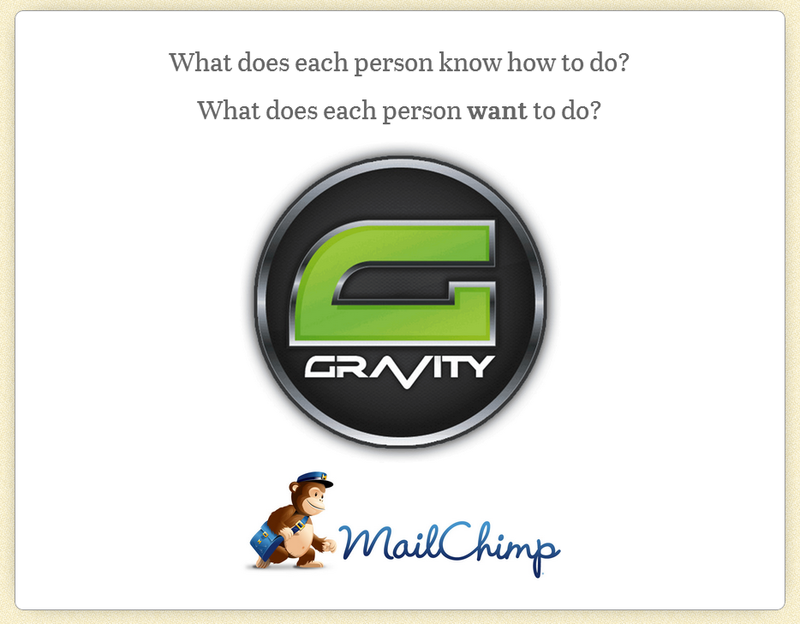 Note – this isn’t an exhaustive tutorial of either Gravity Forms OR MailChimp; just showing this particular technique. You’ll need to have, at minimum, a Gravity Forms Business License (currently $99/year) to utilize the MailChimp add-on, or you can talk to me about setting this up for you on your site if you don’t want to fool with it yourself. I’m going to assume for the purposes of this post that you’ve already installed the MailChimp add-on for Gravity Forms and have created an account. Ah, early 70s children’s television. Good times, good times. So – first we’ll create our poll in Gravity Forms. Here, I’m going to let people check off more than one response, but you could use other types of responses (radio buttons, a dropdown, etc.) if you’d prefer. Keep that tab open in your browser, because we’ll come back to Gravity Forms in a minute, but hop over to MailChimp. 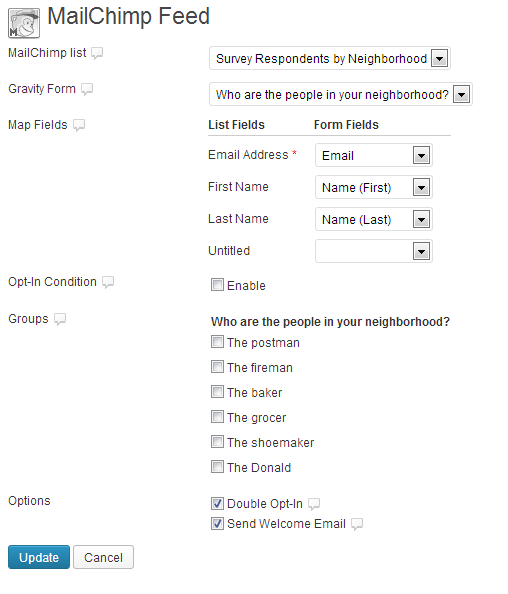 Create a new list in MailChimp that will correspond to your Gravity Form. After you’ve created your list, the next step is to create groups within that list. When you view the subscribers for the list, you’ll see a heading at the top for Groups. Here’s where things get amazing. Sometimes, you’ll want to send out an email bulletin to all of the contributors to your website – for that, you can use this MailChimp list we’re creating that has ALL of the respondents to the form. But sometimes, you just need to get information to a particular segment of the list. 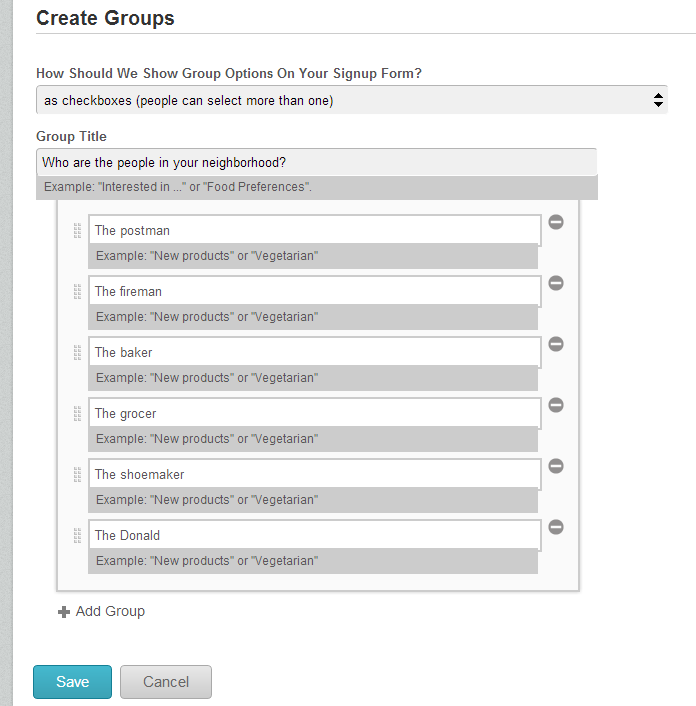 Creating groups allows you to do so with ease. 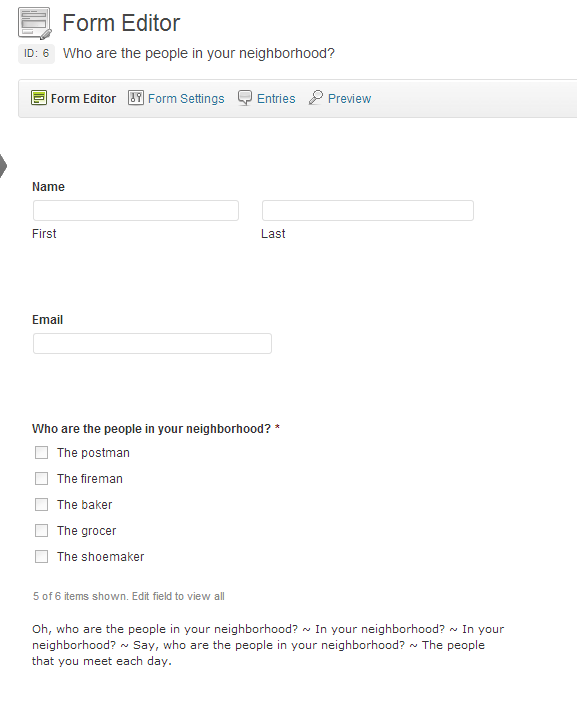 We’re basically going to mimic the form we already created on our own site via Gravity Forms. Later, when it’s time to create an email campaign, we can send to a segment of our list instead of to all of the subscribers. This capability is so useful – you could set up a newsletter for customers based on their past orders, or for blog readers based on their interests, or for your neighbors based on their tolerance for Sesame Street. The possibilities are endless. Here, we’re going to match our list back up with our Gravity Form. Now that we have a list set up in MailChimp with particular groups, hop back over to Gravity Forms and click on the MailChimp add-on. 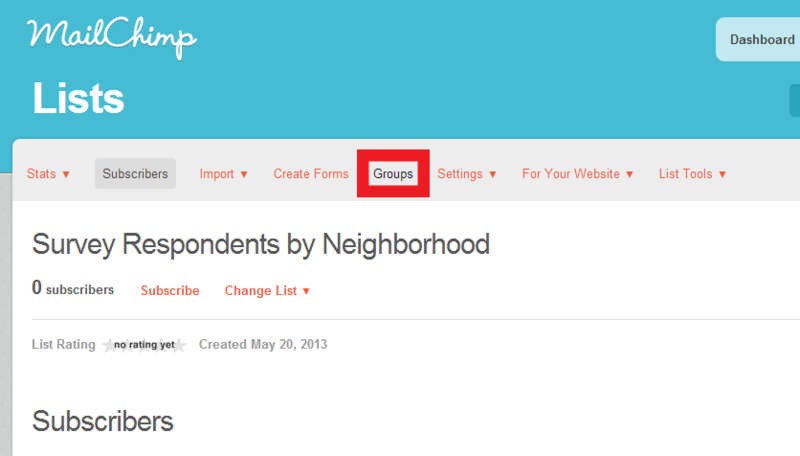 (Here I assume you’ve already got that set up – if not, here’s an overview of using Gravity Forms with MailChimp.) All we need to do is match the fields between our two forms. 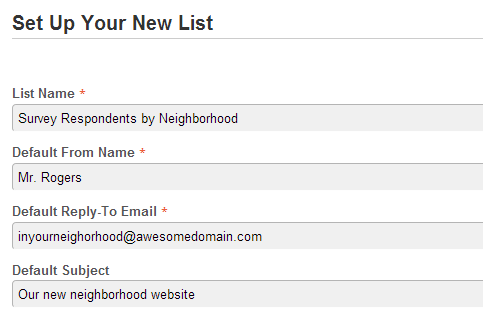 First, choose the relevant MailChimp list. Once you’ve selected it, you’ll see that it pulls down the fields and shows how they can be linked to the corresponding fields in MailChimp. Note – if you do this step BEFORE creating the groups in MailChimp, you won’t see the full list of fields because there won’t be anything to match them to yet. Work your way through all of the fields until you have it set up the way you’d like. Save it, and you’re done! So – why fool with this, if you’re just working with a group of, say, 25 contributors to a project? Well, I like using MailChimp rather than just emailing people in bulk (always with the BCC field) for two reasons. Give people just the information they really need. If you’re working on a group project, and you throw a ton of information at the contributors that they may not actually need, they can quickly feel overwhelmed and burned out on the project. Using groups for email communication reduces this tendency. Get feedback about how effectively you’re communicating. MailChimp will show you what percentage of recipients have opened each email, and you can even view a particular subscriber’s activity. Now, I wouldn’t suggest you go crazy following up with people – “I see that you opened my last communication at 3:43 AM and I wanted to point out that healthy sleep habits are the bedrock of happy worker bees.” But if you see that people aren’t even opening your emails, you know that you need to work on better communication with your group members. Hope you find this helpful! This post is part of a series on building collaborative websites based on a talk I gave at WordCamp Austin, so if you’d like to stay updated about more posts in this series and other WordPress goodness, you can do so via MY MailChimp Gravity form, which is right there below this sentence. Thanks for reading! Any questions?